A developer, scaffolding company, its director and a roofer have been sentenced after a worker fell around seven metres to his death in Staffordshire. 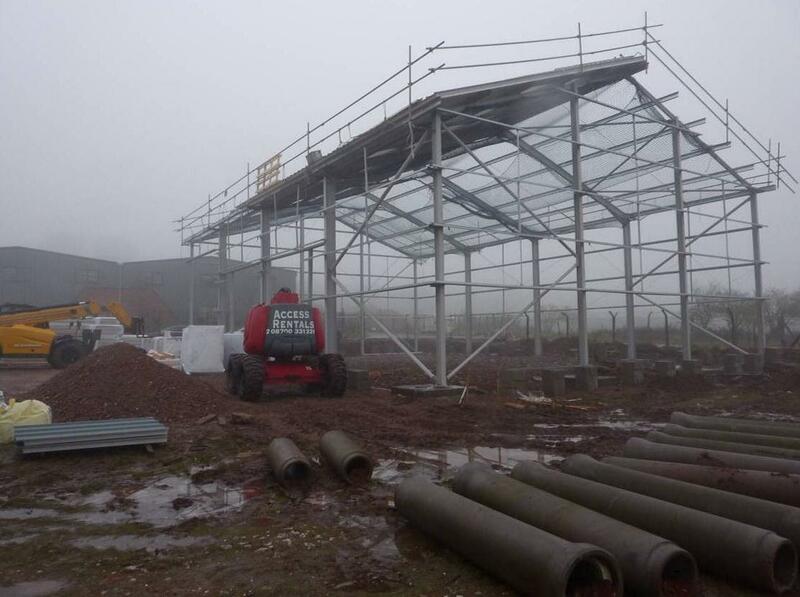 Stafford Crown Court on Tuesday (2 Dec) heard that, on 29 December 2010, experienced roofer Phillip Lonergan was installing the roof on a new warehouse being built by E2 Developments Ltd on land at Cotton Lane, Fauld, Tutbury. He was standing on the edge of the roof when he slipped and fell through a gap of more than 50 centimetres between two scaffolding rails erected to form temporary edge protection. Mr Lonergan, 36, of Burton-on-Trent, died in hospital the same day from head injuries. A Health and Safety Executive (HSE) investigation found that the edge protection had been provided by Nottinghamshire-based Albion Tower and Scaffold Ltd. The company’s director, Lee Cotterill, who had no formal qualifications as a scaffolder, had overall control of the design, planning and construction of the edge protection and personally signed it off as being safe. The edge protection was in the form of two scaffolding guardrails running around the roof edge, which were attached to horizontal scaffolding tubes. However, British Standards only allow a minimum of two guardrails to be in place when the angle of the roof is ten degrees or less. The roof Mr Lonergan was working on had a pitch of 20 degrees. Roofer Peter Allum was approached by E2 to install the roof panels and he, in turn, offered a number of roofers the work, including Mr Lonergan. He was supplied with the roof plans showing the 20-degree angle in October 2010 but failed to deal with the risks posed by the inadequate edge protection. The investigation also found E2 Developments was not aware of the Construction (Design and Management) Regulations 2007 which required the company, as the client, to notify HSE of the work and appoint a competent scheme co-ordinator and principal contractor. E2 Developments Ltd, of Hopley Road, Anslow, Burton-on-Trent, pleaded guilty to breaching Regulations 14(1), 14(2) and 22 of the Construction, Design and Management Regulations 2007 and was fined a total of £66,000 with costs of £13,200. Peter Allum, 41, of Beamhill Road, Burton-on-Trent, admitted breaching Section 3(2) of the Health and Safety at Work etc Act 1974 and was fined £1,500 with £1,500 costs. Lee Cotterill, 53, of Marple Drive, Aston-on-Trent, Derby, pleaded guilty to breaching Section 3(1) of the Health and Safety at Work etc Act 1974. He was sentenced to three months in prison, suspended for 12 months, and ordered to pay costs of £4,000. Albion Tower and Scaffold (East Midlands) Ltd, of Common Lane, Watnall, Nottinghamshire, was fined £53,000 and ordered to pay £15,500 in costs after pleading guilty to the same offence. “Each defendant failed to ensure Mr Lonergan and other roofers could work safely. In each case their failure was a significant cause of Mr Lonergan’s death. “The temporary edge protection should have had a third guardrail to reduce the space for a person to slide through. It should also have had netting around the edge, or toe boards. No such safety measures were in place. The edge protection was therefore inadequate to reduce the risk of serious harm – something that should have been obvious to both Albion and its director Lee Cotterill. “E2 was provided with architects’ plans showing the roof was at a 20-degree pitch but failed to plan, manage or monitor the work in order to eliminate the risk of a fall. One of the directors had never heard of the regulations the company should have been working to. It was therefore very difficult for the company to discharge its duties under those Regulations if directors were ignorant of them.